Avakian was born in Armavir, Russia, to Armenian parents. His younger brother was the photographer and filmmaker Aram Avakian (1926–1987). The elder Avakian attended Yale University, and became an avid collector and fan of jazz music. While still at Yale he was responsible for the first reissues Columbia put out around 1940, discovering some unissued Louis Armstrong masters from his Hot Five and Hot Seven period in the process. He later produced some of Armstrong's most important albums of the traditional jazz revival era, including Louis Armstrong Plays W. C. Handy. His annotations were noted for the education they provided to their listeners. To expand on this concept, in 1946, Avakian started a course in jazz history at Columbia University. His long tenure at Columbia Records culminated in his becoming responsible for the Popular Music and International divisions. During that time, Avakian introduced the LP record format created by Columbia engineers and produced the industry's first 100 long-playing discs of popular music and jazz. He also produced the first live LP—Benny Goodman’s 1938 Carnegie Hall concert. While at Columbia, Avakian signed and produced Dave Brubeck, Miles Davis, Louis Armstrong, Johnny Mathis, Rita Reys, and Erroll Garner to the label, among others. In 1959 he was hired as one of the founding A&R managers for the newly established Warner Bros. Records and also worked as a producer for RCA Victor. In 1960-61 he produced recordings by Bill Haley & His Comets for Warner Bros. Records. Additionally, he signed Bob Newhart, producing the first comedy album to win a Best Album Grammy Award. In 1962 he was responsible for organizing Benny Goodman's successful tour of the USSR. 2010 – National Endowments for the Arts AB Spellman Jazz Advocacy Award. The nations highest honor in Jazz for his work as a Producer, Manager, Critic, Jazz Historian and Educator. 2009 – The Trustees Lifetime Achievement Award (Grammy) from the National Association of Recording Arts and Sciences for contributions to the music industry worldwide. ↑ Cook, Richard (2005). Richard Cook's Jazz Encyclopedia. London: Penguin Books. pp. 24–25. ISBN 0-141-00646-3. 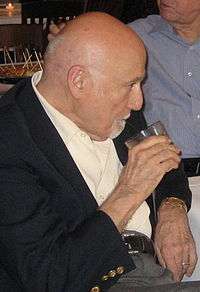 Wikimedia Commons has media related to George Avakian. 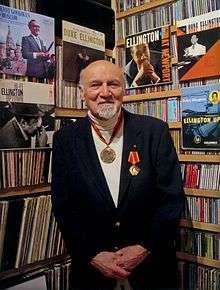 George Avakian and Anahid Ajemian papers, 1908-2013 Music Division, The New York Public Library.